Nienna Surion is a very playful and optimistic cosplayer. 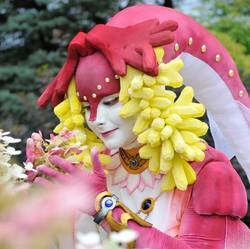 For the moment, she is known for her Diva costume from the 5th Element movie and also for her Legend of Zelda cosplays. She started cosplaying in 2009 at Cosplay de l'Imaginaire. She reached the Master level in 2015 at Ottawa Comiccon. And then, at Otakuthon 2015, with DarKarnival Butler collaboration, she was extremely successful at the Canadian World of Cosplay Summit Finales. She loves sharing and discovering new things. Headstrong, she prefers to discover by herself and then sharing the good news after. Nothing is more passionate than to resolve a challenge of gravity-solidity-weight-light etc. For her « nothing is impossible, all is allowed ». This citation, which sounds directly out from Assassin Creed, is in fact her motto. You would like to create something complex, but common materials are not working (or too expensive)... solution: Talk to her! She will have a lot fun helping you out. Lastly, for her, cosplay will always be a fabulous hobby... Always for the fun of it!